Sweater Dress weather continues here in northern Illinois. 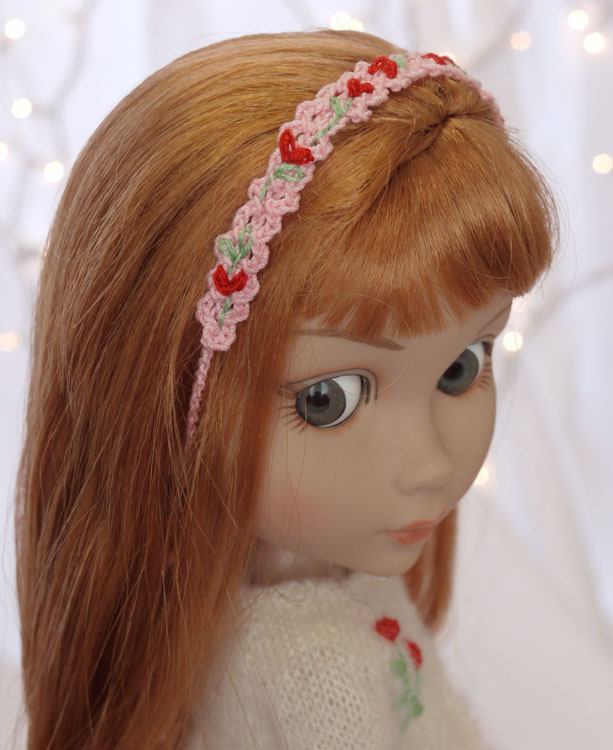 While it is snowy and cold outside I love to sit in front of a warm fire with a cup of tea, coffee, or cappuccino and knit little dresses and sweaters that will be made into pretty ensembles for one of my girls (dolls). I love the simplicity of a sweater dress and the large area it presents for embellishment. It is like a blank canvas waiting to be painted upon. Kaye Wiggs Millie is the perfect little model for a sweater dress. 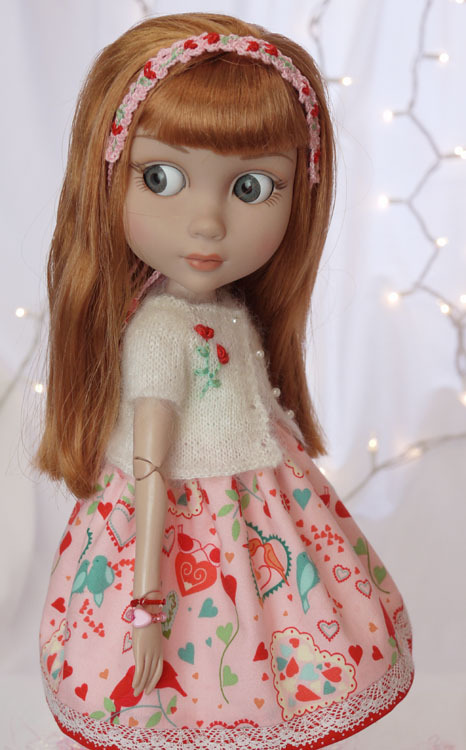 She is only 11″ tall with a slender body so I can nip in the waistline a bit and give the skirt a slight flare and it is very flattering on her. This sweater dress started out with a pair of printed tights that I ended up not using, but they gave me a starting place for picking the color palette. I ended up using more floss colors than I usually do for the embroidering on this dress. Each rose uses a different set of colors and the tiny hearts are embroidered in one of three slightly different shades of red. The slight variation in color makes a more interesting piece, I think. I am so happy when I learn a little something new. The Peruvian Highland wool yarn is a heathered pink color with tiny bits of red orange and magenta mixed in with shades of pink. The tassel on Millie’s slouch hat is made with various colors and weights of yarn. For more information on Millie’s “Cozy Hugs for You” ensemble please visit my “Available for Sale” page on cindyricedesigns.com . 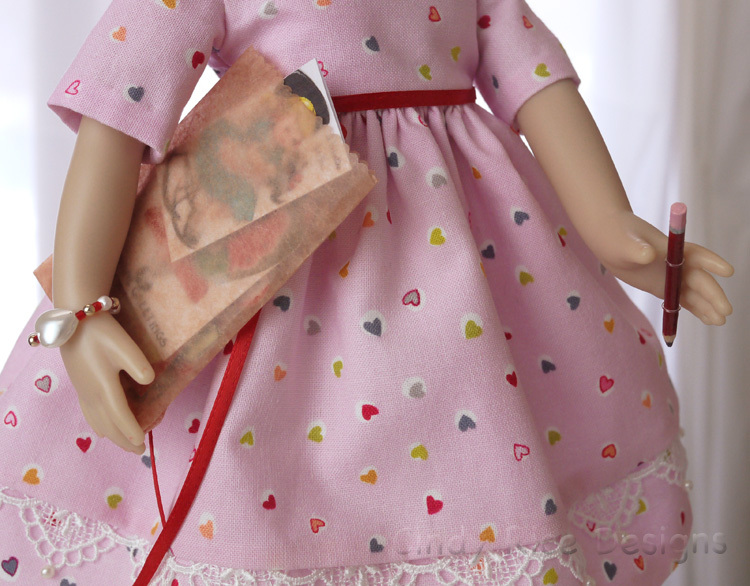 This entry was posted in Embroidery, Kaye Wiggs, knits, Millie, Valentine's Day and tagged ball jointed doll, BJD, doll dress, embroidery, hat, Kaye Wiggs, knit, Millie, Valentine's Day on January 23, 2015 by Cindy Rice. Do You Remember Valentine’s Day in Grade School? Gosh, I do. Well . . . sort of. I also remember the big box with a slit in the top that had been decorated for Valentine’s Day. At the start of the school day, we would “mail” our Valentines in the box. When it came time for our party, one or two students would be in charge of passing out the cards. We would sit at our desks anticipating the delivery of our valentines. I hate to say this, but I have a vague memory of students counting the number of valentines they received and comparing them to the amount their other classmates received. Thankfully, times have changed and everyone is treated fairly, but the excitement of wondering who you will receive a valentine from is gone. Now it’s all about the candy and who can resist candy? My Little Darling, Gina, has been “shopping” for her valentines at Grandma’s house. 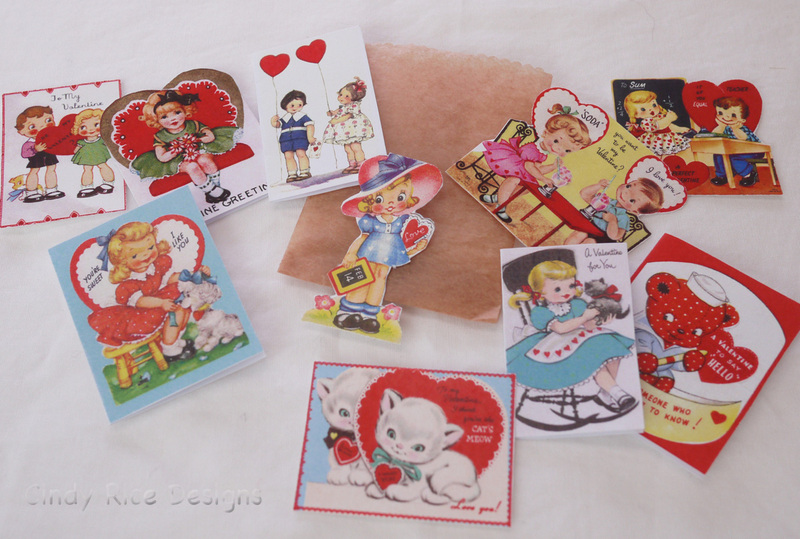 Grandma had all sorts of vintage valentines left over from long long ago. 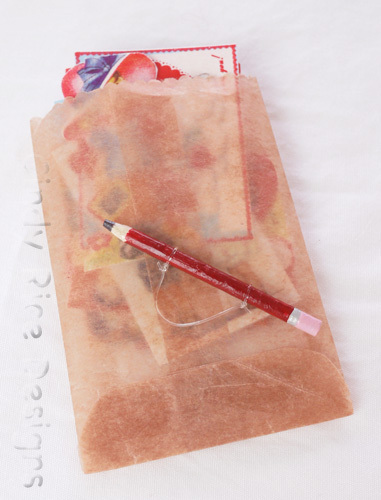 Gina has a bag full and has her pencil ready to start writing out, “Love, Gina”. There’s even one for her teacher. For more information on Gina’s “For My Valentines” ensemble please visit my “Available for Sale” page on cindyricedesigns.com . 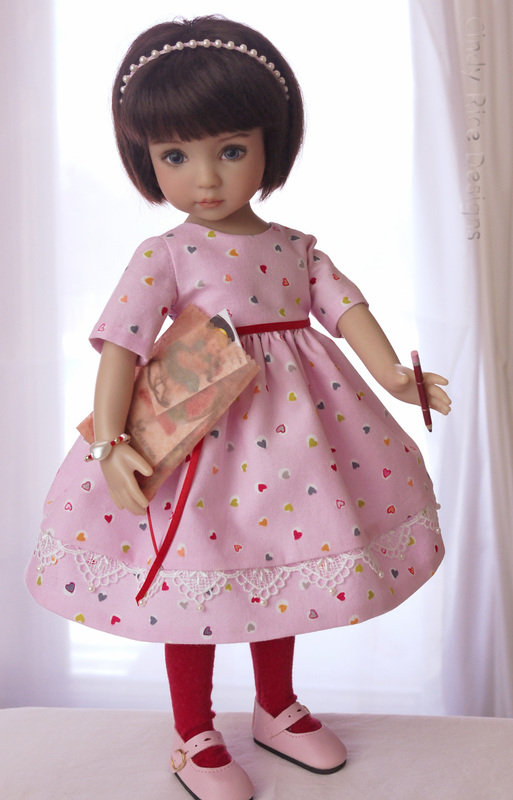 This entry was posted in Doll Dresses, Effner Dolls, little darlings, Valentine's Day and tagged doll dress, effner, little darlings, Valentine's Day on January 16, 2015 by Cindy Rice. It’s been a while since my Patience has been featured in a post and I was starting to feel bad. Am I a bad doll mom? Maybe…ugh…okay, okay, no more guilt. …in all of her whimsical cuteness! I think this ensemble matches Patience’s personality perfectly, don’t you? 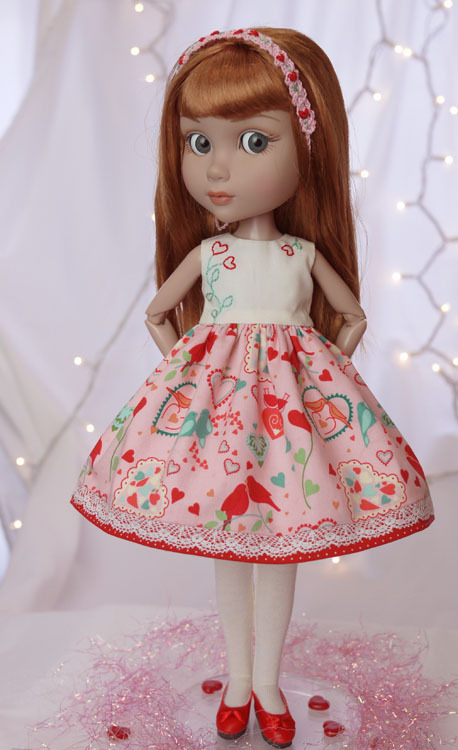 The sunny and warm cotton print features lots and lots of different heart motifs and little lovey dovey birdies, such fun to look at, if you can take your eyes off of her cute face, that is. Patience’s dress looks pretty without the cardigan too. You won’t see too many of my crocheted pieces with embroidery. For me, embroidering on crochet is touch and go because the crocheted fabric is “bumpy” and it’s hard to get the stitches to lay on top of the fabric. However, when the pieces work out, like this headband, I really like the look. For more information on Patience’s outfit, please visit the “Available for Sale” page on Cindy Rice Designs. This entry was posted in Crochet, Doll Dresses, Embroidery, knits, Patience, Sewing, Sweaters, Valentine's Day and tagged crochet, doll dress, doll sweater, embroidery, Patience, Valentine's Day, Wilde Imagination on January 15, 2015 by Cindy Rice.